That’s sausage and rice to you English-only folks. But for you eclectic, international gourmands, start thinking about what would happen if you did a culinary mashup of Spain, Mexico and Italy. Then get a napkin, fast, ’cause I know your mouth is watering just like mine was when I started cooking up this rich and spicy mélange of arborio rice, chipotle in adobo, and Spanish chorizo. 1. In a small saucepan, bring the vegetable stock to a boil, then keep warm over low heat. 2. In a large skillet, warm the olive oil over medium-low heat. Add the onions and garlic and cook, stirring occasionally, until the onions are translucent, about 5 minutes. Add the rice and continue cooking, stirring occasionally, until it’s lightly toasted and opaque, about 2 minutes. 3. Add the wine and cook over medium-low heat until absorbed, about 5 minutes. Ladle 1 cup of the stock over the rice and simmer, stirring frequently, until absorbed. Continue to add the stock ½ cup at a time, stirring frequently, until the rice is creamy and tender but still slightly chewy in the center, about 20 minutes. 4. 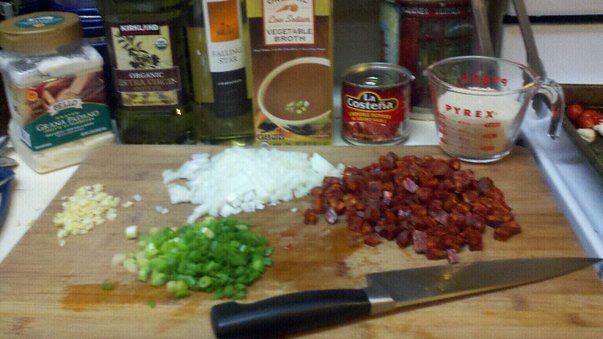 Meanwhile, in a medium skillet, cook the chorizo over medium-high heat until lightly browned, about 5 minutes. 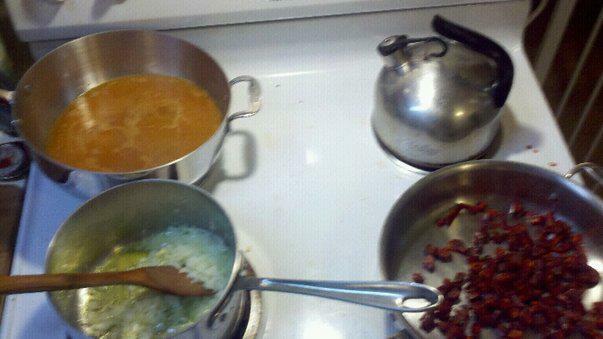 Stir the chorizo, the chipotle in adobo, and half of the green onions into the risotto until combined. Add the Parmesan and season to taste with salt and pepper. 5. Divide the risotto among 4 plates and garnish with additional scallions and Parmesan if desired. Serve immediately. For those of you who made note that there was a second recipe emerging at the same time as the risotto, I applaud you for paying close attention. (insert smiley-face emoticon here) The roasted veggies you see were the leftovers from a crudité plate from the night before. Everything was tossed onto a large cookie sheet, sprayed with olive oil (thank you, TJs) and seasoned lightly with kosher salt and fresh ground pepper. Roasted for about 20 minutes at 425º. So easy and so yummy. I get asked a lot by fellow moms how I get to my mega-picky DS to eat healthy food. To be honest, a lot of it has come with conditioning; he always received Ak-Mak crackers instead of saltines, Cheerios instead of Froot Loops, puffed rice instead of Rice Krispies. There is one thing he loves, though, that is almost invariably unhealthy: french fries. It’s his favorite food. Period. And I’ve tried sweet potato fries, and butternut squash fries, and zucchini fries, all to no avail. Most homemade french fries taste like the ones your mom tried to pass off to you as being “just as good” as the ones from your local fast food joint, but seriously? They were white, watery, and not crunchy at all. So if you want your child to eat a healthier (and cheaper) version of the ubiquitous McSpud, try this recipe on for size. Some notes before we start, by the way: smaller potatoes work better than large ones for this recipe. I’m also a big proponent of using organic potatoes, because conventional ones are sprayed with a sprouting inhibitor that can’t really be washed off (although peeling the potato does reduce exposure levels dramatically). The potatoes I used to make the batch you see in the photo were purchased from a vendor at the Old Towne Orange farmer’s market (Saturday mornings, 8am-noon, on the corner of N. Cypress and W. Palm). 1. Preheat your oven to 500 degrees. Put a large cookie sheet in on the middle rack. 2. Scrub clean your potatoes and cut off any eyes or brown spots. Leave the rest of the skin on and slice into 1/8-1/4″ rounds. Then cut each slice into 1/8-1/4″ ribbons. You should end up with a lot of matchstick looking pieces. 3. Put the potatoes in a bowl and salt very liberally. Toss them by hand for a couple minutes, squeezing them gently on occasion, in order to get the potatoes to release some of their water. Once you get completely bored with this part, pat the potatoes with several paper towels until they are as close to bone-dry as you can get them. 4. Wipe out the bowl and return the potatoes to it. Spray the potatoes liberally with canola oil spray and toss them by hand to coat thoroughly. 5. Pull the cookie sheet out of the oven. Place the potatoes in a single layer on the sheet with none of the potatoes touching. Return the cookie sheet to the oven, reduce the heat to 450 degrees, and bake for 15 minutes. Once baked, pull them out promptly and transfer to a serving plate. It took forever for me to be able to make this recipe. DH dislikes both salmon and grapefruit, and I have only two or three friends who like salmon at all — one of whom can’t eat grapefruit on account of the medication she takes. So it took me like five months to get someone over to the house for whom I could whip this up. I guess I shouldn’t kvetch too hard over five months; I’ve still got a recipe from last June sitting in my inbox waiting for me to take it on. Anyway, I digress. This is truly delicious and worthy of the time it takes to squeeze the grapefruit. Incidentally, I strongly recommend using pink grapefruit. Spray a large non-stick skillet with cooking spray and heat to about medium. Add the shallots and saute until tender, about 4 minutes. Add the salmon and grapefruit juice. Cover and simmer over low heat until the salmon is opaque, about 6 to 8 minutes. Transfer the salmon to warm serving plates. 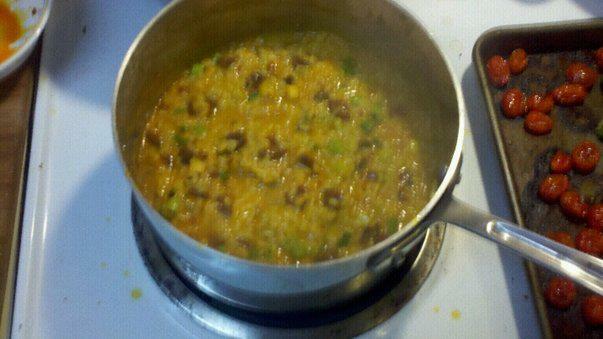 Increase the heat to medium high and simmer the juices, about 5 minutes, until reduced by half. Pour over the salmon. No photos from me on these, since the photos that accompany the original recipes are way prettier than the food I turned out. I don’t know if I’d make the dip a second time, but the grilled cheese sammies we made from that pimento cheese were completely rockin’. You’ve heard of Hungry Girl, haven’t you? Not everyone has, but everyone should. Lisa Lillien (the HG) and her team have devised a gazillion ways to heat the stuff you love without it inducing a coronary. For those of you on Weight Watchers, she really helps you out by including the Points Plus totals on her recipes and other recommended noshes. I get her daily email blast, and although not all of it appeals to my gourmet side, a lot of it is totally doable — without giving up any taste. In fact, in some cases I think I liked her versions better! What really blew me away, though, was that the DH, the DS, and two of our friends (one who eats anything, and one who won’t touch any vegetation beyond corn and potatoes) scarfed all this stuff down right as it was coming out of the oven. Wish I had made more! When I grow up, I'm gonna be fries!!! Before I tell you how great this recipe was, I have to confess: I hurt myself pretty bad in its creation. I had arrived at the making-the-dressing part, and added the oil and lemon juice before I reached for the two spent lemon halves and my Microplane. Moments later there is some zest in the bowl, but more noticeably there is blood all over my hand. What the…? 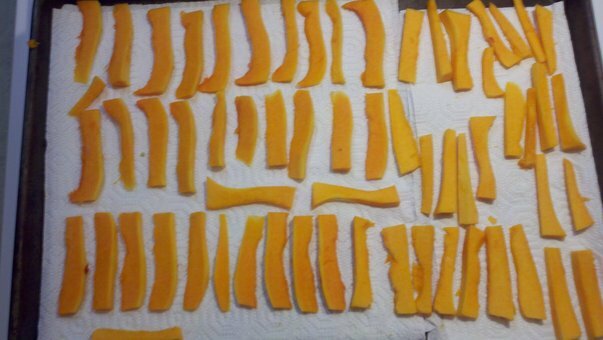 I’m not sure where/when my mind wandered off, but fortunately the sink is right next to the chopping block where I am working, and I quickly get everything (hand, tools, remaining lemon rind) washed and rinsed. I grab a towel and put pressure on my thumb. Yikes, it hurts! A closer look reveals that I have completely shredded the side of my nail bed. I can tell this is not going to heal cleanly. And to top it off, I was working with LEMON, so now the wound’s got acid in it. For those of you wondering, no — there wasn’t any blood in the pasta, and no — I didn’t continue to use the lemon half that had been bloodied. The lesson, of course, is use a cut-resistant glove when working with this type of tool. Or at least don’t let your brain go on vacation while using it. Later that night, DH joked about how there’s always a little bit of me in everything that comes out of our kitchen. In a large pot of boiling water cook the orzo for 6-8 minutes or until just beginning to be tender. Add snow peas and continue to cook for another 2 minutes. Rinse under cold water and drain. Put in large mixing bowl. In non-stick skillet sprayed with vegetable spray, cook seafood over high heat for 2 minutes or until just done at center. Drain any excess liquid. Add to orzo in serving bowl. Wait until the this mixture is completely cooled before proceeding. When cool, add tomatoes and feta cheese. Toss to combine. In small bowl whisk together olive oil, lemon juice, lemon zest, garlic, oregano, and pepper; pour over salad and toss well. Chill before serving. Pizza Night at our place is generally a big deal. Sometimes we order in from our favorite pizza joint, Buccaneer Pizza, and sometimes it’s frozen pizza from Trader Joe’s (even Costco if our friend Eric is bringing the feast). As of late I’ve been making pizza from scratch at home, with pizza dough and sauce TJs, but I have friends who always make their own pizza dough and claim it’s as easy as pie (sorry ’bout the pun). So after tooling around with some recipes online, I came up with this one. It uses a bread machine, so if you have one gathering dust in the highest cabinet in your kitchen, it’s time to crawl up there and bring it down for a test run. In my bread machine the whole recipe takes less than 90 minutes, which is less time than it would take for me to go to TJs, get completely sidetracked be all the other cool stuff I want to buy, and drive home. Incidentally when I’m using fresh dough I generally do not make one big pizza. Instead I make tiny pizzas in muffin tins (big thanks to Catherine at weelicious for the inspiration on that one). This recipe made 2 dozen pizza muffins. Put all ingredients except olive oil in a bread machine in the order recommended by the manufacturer (note: in my case, it went flour, salt, sugar, butter, yeast, beer). Select Dough setting, and press “Start”. Remove dough from bread machine when cycle is complete. Have you planted zucchini in your garden before? Then you know to expect that at the end of the season you are going to have zucchini up to your elbows and struggle to find a way to use them all. This recipe is delicious in spring when the zucchini in the market are small and delicate, but I think it’s perfectly matched for those big pigs you’ll have at the end of summer. I think it would also work well with goat cheese or blue cheese, if you’re not a big fan of feta. Grate zucchini into a large mixing bowl and stir in salt. Place in a sieve and let stand for 30 minutes. Rinse and let stand for another15 minutes. Squeeze excess water from zucchini (a dishtowel is perfect for this task) and return to the bowl. Add remaining ingredients and mix thoroughly. Form mixture into 12 equal size patties. Coat a large skillet with canola oil and heat on medium-high until almost smoking. Fry in batches until golden, 4 to 5 minutes and then transfer to warm oven. Mix yogurt with dill and chill until ready to serve. Transfer pancakes to platter for serving and add yogurt on the side. Cook egg noodles as per the manufacturer’s directions. Drain and set aside. In a large skillet, add the olive oil and heat to almost smoking over medium high heat. Add the onions and mushrooms, and saute until mushrooms are softened and the onions are turning golden brown. Add a dash of salt and pepper (the salt will pull the last of the water out of the vegetables) as well as the garlic, and continue to saute, about 5 minutes. Remove the vegetables from the pan to a heatproof bowl. Deglaze the pan with white wine, picking up the fond on the bottom of the pan, and add this liquid to bowl with the vegetables. Reduce the heat on the pan to medium and add the turkey. Brown the meat until all traces of pink have disappeared, about 10 minutes, and then drain any fat from the pan. Sprinkle the cornstarch over the meat and toss to coat. 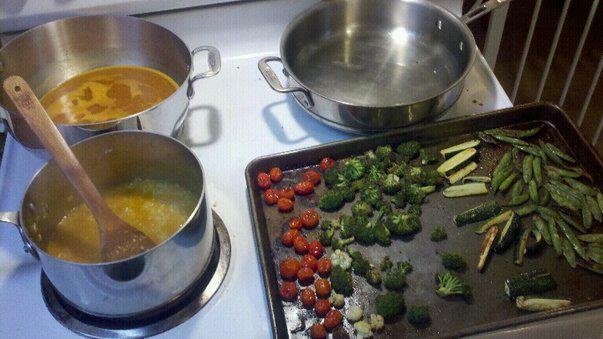 Stir in the broth, the remaining wine, and the vegetables, and bring to a simmer, about 5 minutes. Stir until sauce thickens. Add additional salt and pepper, the cayenne and the poppy seeds. Add the egg noodles and stir to combine. Remove from heat; stir in yogurt. Remove to a serving platter. Garnish with chopped parsley. This is going to be my third Mother’s Day as an official mom. (Technically it’s my fourth, but in 2008 Noah was still just a mass of cells in utero. I wasn’t even 100% sure I was pregnant.) Being a mom has drastically altered my life. Wait — is there a more extreme word than “drastically”? ‘Cause that’s me. So naturally Mother’s Day is a big deal to me. Big. HUGE. And while I will spend lots of energy recognizing the other moms in my life, I really do want some recognition too. This is not a time to be a martyr; this is a time to sit back and receive appropriate adulation. You can stop laughing now. Or not. A lot of moms out there are partial to flowers, or jewelry, or breakfast in bed. I am not one of those moms. I’m not super into “stuff”, as it were; I’m more into “experiences”. My DH has been known to kvetch about how hard it is to buy for me; I disagree, but I am apt to disagree just based on principle. So I’m going to make it easy for him this year — and anyone else who needs to buy (aka invest, aka leave a sacrifice at the altar) for a mom-like figure in the next week or so. 1. A card is essential. The price of the card is not, nor is the pre-printed message inside. What is all-important is the heartfelt personal message that YOU write. This may be tough for some guys. I get it. Don’t rush it — take your time, write what you feel. You might want to scrap 2011 and just start on 2012 now. Incidentally, there should be one card from each child and one from the babydaddy. Maybe even one from the animals. 2. Let me sleep in. Or at least let me get up and go at my own pace without having to race to change diapers, make the coffee, etc. It would also be a good idea to let me take the first shower, since this is one day you don’t want to risk the hot water running out while I am lathered up. 4. OK, guys: you have a mom. She is YOUR mother, not mine. Ergo it is YOUR job to provide for her recognition. If I end up taking care of this… well, please refer to #3. I would like to have the opportunity to get the garden started. That means I need to go to Home Depot. You can come with me, or not. If you’re not coming with me, I’m not taking the kids along. When I get back, you all can help, or you can watch the kids while I am in the dirt. I would like an energy audit for the house. I would like for you to set this up. I have a to-do list that desperately needs tackling. The greatest gift you could give me is to offer up a number of hours where you will work on said list. The second greatest gift you could give me is to not b**** about having to be Mr. Handyman while you work on said list. I reallllly would like to have some time at the spa. I am reallllly bad at scheduling this, because as a mom I have a tendency to give away my me-time without a second thought. This is why my pedicure looks like crap. So please don’t just buy the services; I need you to schedule them for me, and I need to know that the kids are being watched while I am away. Before I drift off to sleep on Sunday, May 8, please tell me how much you love me. Tell me that you think I’m a great mom. Tell me *why* you love me and what *exactly* makes me a great mom. I know this is kind a replication of the card thing, but trust me… it’s in your best interests if you double dip on this one. Seriously. I know there are some other mothers reading this. What do *you* want for Mother’s Day? PS Feel free to forward this on to certain people who need some prompting in this area. You know what I’m talking about.